PCI compliance is critical to businesses that conduct large volumes of credit card transactions online, such as The Lowry’s Quaytickets. PCI compliance helps these companies establish best practices that keep customer credit card information safe and private, as well as ensuring that they won’t be buried by crippling fines for non-compliance or security breaches. 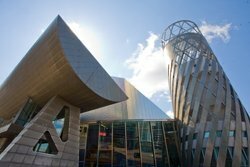 The Lowry required a PCI compliance solution that would work with their existing infrastructure and legacy systems, as well as address their need for security information and event management.